very soon, what at first was a delight to you becomes a burden, and you almost wish the patient would go to some one else. You cannot help wondering why she improved so perceptibly with the first few treatments, and afterwards, even with your increased zeal, seemed to stand still or get worse. Let me tell you why. It is because when you first began to treat, you, so sure of the abundance of Divine Life, calmly and trustingly spoke the truth to your patient. When she got in a hurry, you, beginning to take on responsibility, which was God’s, not yours, grew anxious, and began to cast upon her your compressed anxiety. You were no longer a channel for Divine Live, sweet, peaceful, harmonious, to flow through, but by your intensity and hurry you completely shut off the divine influx, and were able only to force upon her, out of your anxious mortal mind, a few strained, compulsory thoughts which held her as in a vise, and exhausted you. Some healing and other demonstrations of power are brought to pass in this way, but it is always the stronger mortal thought controlling the weaker, and is always wearing to the one working from such a plane. So in this matter of God as our supply, or any other side of the divine law which we from time to time attempt to bring into manifestation, the moment we begin to be anxious, then our quiet is simply the air-tight valve of tension or suppressed anxiety, which shuts out the very thing we are trying to bring about, and so prevents its manifestation. This way of holding with intensity to a thought, be it mental argument for healing, or looking to God for material supply, recognizing that we ourselves have power by such firmness of thought to bring what we want into manifestation, is one way of obtaining results, but it is a hard way. We do thus give out what is within us, and it is helpful and beautiful as far as it goes; but by some mental law this intensity of thought seems to cut off our consciousness from the Fountain Head, thus preventing inflow and renewal therefrom. Hence the quick exhaustion and burdened feeling. We need to rise above this state of tension, to one of living trust. There is such a thing as an indolent shifting of our responsibility upon an outside God, which means laziness, and which never brings anything into manifestation. But there is also a state of trustful passivity, which we must enter into to do the highest work. There are some things which we are to do ourselves, but there are others which God does not expect us to do. (When I speak of ourselves as something apart from, I simply mean our conscious selves. We are always one with God, but we do not always realize it consciously. I speak of ourselves as the conscious part of us.) They are His part, and our greatest trouble lies in our trying to do God’s part, just because we have not learned how to trust Him to do it. 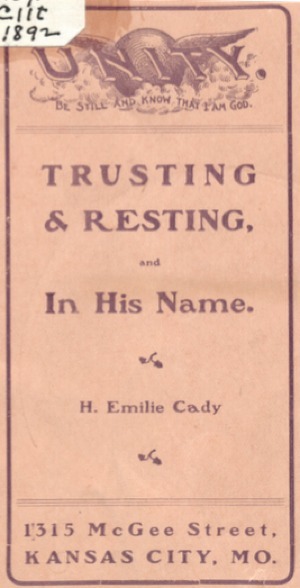 We are, with our conscious thought, to speak the words of life, of trust, of abundant supply, and we are to act as though the words were true; but the “bringing it to pass” is the work of a Power that is higher than we – a Presence which we do not see with these mortal eyes, but which is Omnipotent, and which will always rush to our rescue when we trust it. From the smallest thing of our everyday life to the rolling away of the largest stone of difficulty from our path, it will come in to deliver us. But its working depends upon our trusting; and trusting means getting still inside. In this effort of ours to bring into manifestation the good which we know belongs to every child of God, it is when we get beyond the point where we try to do it all ourselves, and let God do His part, that we get the desires of our heart. After we have done our part faithfully, earnestly, we are told to “Stand still and see the salvation of God which He will work for you.” “The Lord shall fight for you, and ye shall hold your peace.” See the conditions here imposed. This invisible Presence will remove the big difficulties, which look to your mortal vision almost insurmountable, from your path, only on condition that you stand still. The Lord shall fight for you if ye hold your peace. But there is nowhere any such promise of deliverance for you while you preserve a state of flutter within. Either one – this state of flutter, or a forced external quiet, which simply means compressed anxiety – completely prevents this invisible Omnipresent Force from doing one thing for our deliverance. It must be peace, peace; possess your soul in peace, and let God work. We must learn that the time of help coming to us is not our part, but God’s We do know that in all the accounts in Scripture of those who realized God’s special deliverance form t heir troubles – from Abraham going forth to sacrifice his son, down to when Jesus put out his hand to save the sinking and faithless Peter, and even after this in the experience of the Apostles – this invisible Power came to hand just at the right time always – never a moment too late. The promise is, “The Lord shall help her, and that right early”; or as the Hebrew reads, “at the turning of the morning,” which means just the darkest moment before dawn. So if, in whatever matter you are trying to exercise trust in your Father, the way keeps growing darker and darker, and apparently the help goes further and further away instead of coming into sight, you just grow more peaceful and still than ever, you may know that the moment of deliverance is growing nearer for you with every breath. In St. Mark’s account of that early morning visit of the women to the tomb of Jesus, when, bent on an errand of loving service, they forgot entirely the immense stone weighing several tons lying across their path, until they were almost at their journey’s end, and then one exclaimed in momentary dismay, “Who shall roll away for us this stone?” he says: “When they looked, the stone was rolled away; for it was very great.” Isn’t that “for” full of meaning to us? The very greatness of the difficulty which made it impossible for human hand to remove it, was the more reason why it was done by this invisible Power. Did it ever occur to you, my reader, that you are almost daily taking God’s name in vain? Unless you are very watchful, very careful, you are doing so. When God called Moses to lead the children of Israel out of Egypt, “Moses said unto God, Behold, when I come unto the children of Israel, and shall say unto them, The God of your fathers hath sent me unto you; and they shall say to me, What is his name? what shall I say unto them? I AM, then, is God’s name. Every time you say I am sick, I am weak, I am discouraged, are you not speaking God’s name in vain, falsely? I AM cannot be sick; I AM cannot be weary, or faint, or powerless; for I AM is All-Life, All-Power, All-Good. If you speak the “I am” falsely, you will get the result of false speaking. If you say, I am sick, you will get sickness; I am poor, you will get poverty; for the law is, “Whatsoever a man soweth, that shall he also reap.” “I am,” spoken upward, toward the good, the true, is sure to outpicture in visible good, in success, in happiness. Does all this sound foolish to you? Do you doubt that such power goes with the speaking of that name? If so, just go alone, close your eyes, and in the depths of your own soul say over and over the words, “I am.” Soon you will find your whole being filled with a sense of power which you never had before – power to overcome, power to accomplish, power to do all things. I am, because Thou art. I am what Thou art. I am one with Thee, O Thou Infinite. I AM! I am good. I am holy. I am well. I am, because Thou art. Says the Psalmist, “The name of the Lord is a strong tower; the righteous runneth into it and are safe.” They who think rightly about the power of the I Am, spoken upward, just simply have to run into it, as into a strong tower or fortress, and they are safe. Did you ever go into a meeting where the drift of all the “testimonies” given was the I Am spoken upward – “I am happy to be here,” “I am glad I am a Christian,” “I am hoping and trusting in God,” etc., etc.? Attend such a gathering, and almost before you know it, you will find yourself lifted entirely above all your troubles and anxieties. You leave such a meeting with a feeling of joy and lightness, and a consciousness that you have the power to overcome all the home troubles and worries; and you go, singing and confident, toward the very fire which, an hour before, seemed about to consume you. Dear friends, you who at times feel almost discouraged, you who are being continually “sand-papered” by the petty worries and anxieties of life, just try for one week always saying the I Am upward, toward the good, and see what the results will be. Instead of saying, “I am afraid it will rain,” say “I hope it will not rain”; instead of “I am sorry,” say “I would have been glad had it been so and so”; instead of saying “I am weak and cannot accomplish,” say “I Am because Thou art; I can accomplish, because I Am.” You will be astonished at the result. The Christ, speaking through Jesus, said to the Jews who were boasting of being descendents of Abraham: “Verily, verily, I say unto you, before Abraham was, I am.” And Paul, writing to Timothy, said: “Let everyone who nameth the name of Christ depart from iniquity.” Let everyone who speaks the I Am keep it separated from iniquity or from false speaking. Let it be spoken always upward, never downward. Jesus also said, “Whatsoever ye ask in my name” – i.e., in the name I Am – “He will give it you.” Whenever you desire – not supplicate, but desire – speaking the “I am” upward – He will give what you ask. Every time you say “I am happy,” you ask in His name for happiness. Every time you say, “I am unhappy,” you ask in His name for unhappiness. “Hitherto,” he said to the disciples, ‘ye have asked nothing in my name. Ask and ye shall receive, that your joy may be full.” Is not this just the trouble? Hitherto what have we been asking “in His name”? Have we been asking for health or sickness, for happiness or unhappiness, for riches or poverty, by the manner of our speaking the I Am? Have we spoken it upward, toward the good, or downward, toward the not good? That which we have been receiving will tell the story. Jesus said if they asked rightly in his name, their “joy would be full.” Is your joy full? If not, then give heed to your asking. The disciple healed “in the name of Jesus Christ.” In the name of Jesus Christ is in the name of the I Am. Suppose a messenger is sent out from the executive mansion at Washington, to do certain things in the name of the President of the United States. These three little words, “in his name,” invest the messenger with the full power of the President, as far as the closing of that service is concerned. “Him that overcometh will I make a pillar in the temple f my God, and he shall go no more out; and I will write upon him the name of God,” even the name I AM.